2016 Brick House Vineyards, Pinot Noir, Select, Ribbon Ridge, Willamette Valley, Oregon. Wonderfully soulful and with layers of earth, woody/forest notes and dark fruits the estate grown Select Ribbon Ridge by Oregon legend Doug Tunnell’s Brick House Vineyards. This 2016 is an old school beauty with very expansive and textured fruit and wistful elegance, it’s a beguiling Pinot Noir in the Burgundy tradition. Brick House, organic since 1990 and now full Demeter certified biodynamic, is also part of the Deep Roots Coalition that is focus on dry farming and even in a ripe year like 2016 Tunnell made impressively delicate and balanced wines, especially this one, according to Tunnell it’s the most easy-going and approachable of all of Brick House’s Pinot Noirs, the “Select” is a moderately priced, estate grown wine that is a selection of barrels representing all the different vineyard blocks on the farm in the Ribbon Ridge AVA of the Willamette Valley, at the discretion of the winemaker and team. The medium bodied palate oozes with a sense of class and place with pretty floral notes and a mouth that shows blackberry, plum and sweet cherry fruits along with hints of tea, spice, herb, mineral and a touch of chalk with soft tannins as well as nice oak shadings, gaining that subtle earthy charm with air and lingering with an impression of rose petals and strawberries. There’s no drama here, no sharp edges and it’s a wine that sneaks in it’s best qualities without any showmanship, this is a transparent and pure Pinot Noir that tastes dreamy and hits all the boxes without being flashy, enjoy over the next 3 to 5 years. 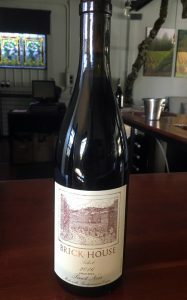 I love all the wines here at Brick House, especially their Pinots, and recent vintages are awesome, but don’t overlook their Chardonnay, which gets better and better, as well as their true Gamay Noir, which is one of the very best in the new world.